...big trout love these bright and lively imitations of baby trout. These are Skip's most popular fly designs for streamer fishing in rivers, streams, and lakes. 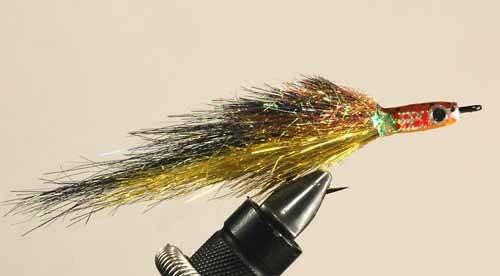 These very bright and very lively imitations of baby trout are often deadly when nothing else seems to work. Big trout especially love them. Skip proved their effectiveness once again this last fall while fishing the massive Upper Columbia River near the Canadian border—the trout would hardly look at another streamer, yet the Morris Minnows consistently hooked big rainbows. But the Morris Minnows are just as effective on smaller rivers. Skip's landed trout up to twelve pounds on this dazzling and productive fly. For imitating juvenile rainbow trout, which big trout love to consume. For imitating juvenile brown trout, which big trout love to consume.